With a wide range of clientele from professional athlete to medical referral, Body Lab (NI) aim is to hold a key focus on the wellbeing of each individual's physical lifestyle through "Physiotherapy", "Exercise & Fitness" and "Nutrition". Our facility registered with "Fitness Industry Authority", provides a private area for our team to work with each client individually. Based on the individual needs of each client, programme design is produced by experts in their field, each maintaining a professional standard of qualification governed by "The Register of Exercise Professionals", "The Chartered Society of Physiotherapy" and "Health Professions Council". The professionals involved and the in depth programme design take one to one physical achievement to the next level. "Our team" are motivated, driven and passionate about their profession and its service to others. 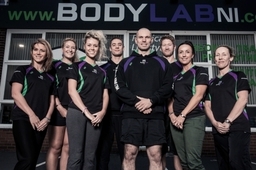 The Studio We are a group of highly experienced, inspirational and motivational studio instructors who know that exercising effectively does not require spending hours in the gym to achieve your goals. Our studio classes will be fun but effective. At "The Studio" our fitness classes are suitable for complete beginners to successful athletes; you'll be training side by side and pushing each other to your own limits. Stop making excuses. Start to see results today! THE STUDIO will also be hosting SPORTS SPECIFIC sessions for you athletes out there looking to get that edge! !